The original recipe is in a foreign language, so I played with it a bit, to come up with satisfactory results. Today I am sharing this recipe with you, and some helpful hints, via pictures, of how to best arrange this impressive creation. Best served warm, with pizza sauce or salsa, on the side. This bread may also be made ahead of time, and warmed up in the oven before serving (wrapped in aluminum foil to prevent drying out), or microwaved in small portions, or individual servings. 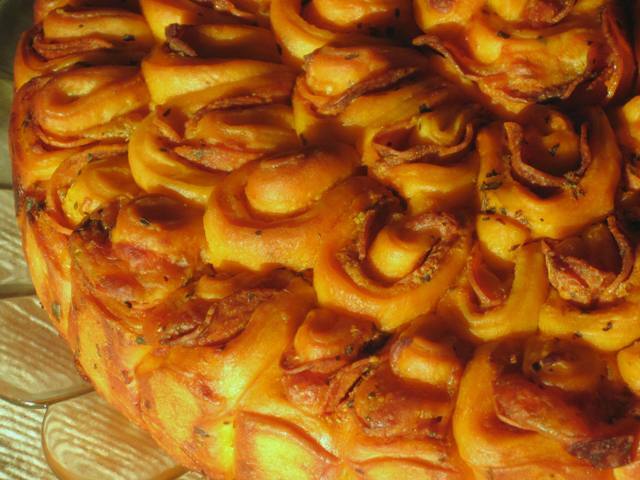 This recipe yields about 60 serving pieces. 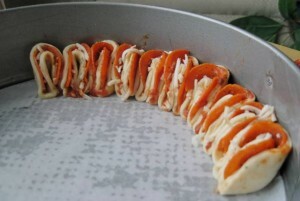 This is how you arrange the sauce, pepperoni and cheese on each dough round. 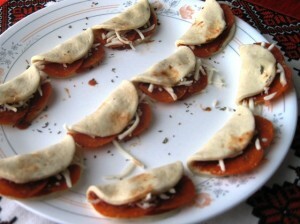 Step 2 on how to fold the filled dough rounds. 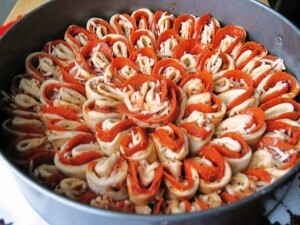 Step 3 on how to arrange the filled and folded pieces in a spring-form pan. in a small bowl, using a fork, mix warm milk, sugar, 5 Tbs. of flour and yeast. Place it in a warm, draft-fee place to rise and get frothy. In a medium bowl mix the heavy cream, yogurt, and baking soda. Set aside. In a small bowl mix the mayonnaise, salt, and Italian seasoning. Set aside. Add the cream/yogurt mixture into the yeast mixture, and mix gently with a fork, to incorporate evenly. Mix in the mayonnaise/salt mixture. Add the wet mixture into the large bowl with flour and mix with a fork. Add in the melted butter, and mix well working with your hands. Transfer the dough onto a floured work area, and knead it for couple of minutes to form a silky smooth dough ball (about 2 minutes). Grease a large bowl with 2 tsp. 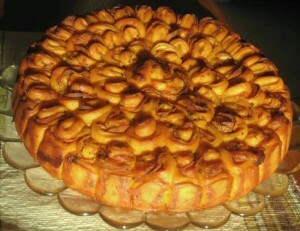 of oil, place the dough in the bowl, and move it around, to oil it on all sides. Cover with a kitchen towel, place it in a warm, draft-free place, to double in bulk (1-2 hours). Prepare a 10 inch round spring form pan, by lining the bottom with a circle of greased parchment paper, and generously grease the sides of the pan with vegetable shortening, such as Crisco. Work with 1/2 of the dough at a time. Place it on a floured work surface and roll it out to less than 1/8 inch thick. Use a 3 inch round biscuit cutter, and cut out circles. 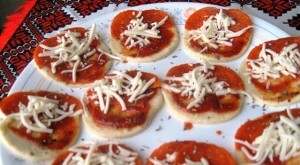 Please dough circles onto a platter and spread 1/2 tsp of pizza sauce, then place two half-circles of pepperoni in top edge of the circle, then place a pinch of shredded mozzarella cheese over the pepperoni. Sprinkle with dried ground Basil. Fold each circle in half , from bottom to top, to cover the stuffing. Then fold again in half from left to right. 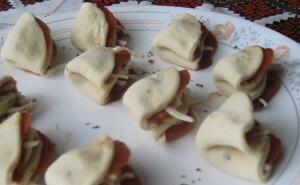 Arrange stuffed dough pockets along the side of the prepared baking pan, to form the first layer. Repeat the above process until all dough is used up, and the pan is filled with stuffed dough pockets. Prepare egg wash by beating the egg with 1 tsp. of water, and use a pastry brush to spread it over the top of the dough pockets. Place the pan on a sheet of aluminum paper, in case it leaks during baking, and place it in the preheated oven on a middle rack. Decrease the temperature to 325 degrees F and bake another 5 minutes. Remove from the oven, let it cool in the pan for 5 minutes. 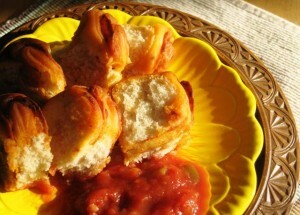 Remove onto a serving platter, and serve warm with pizza sauce or salsa.